Tecsound FT 55 AL is a very high performance acoustic pipe wrap. Its primary function for use in effective pipe sound proofing. It consists of Tecsound synthetic acoustic membrane , porous felt and coated on the outside with reinforced aluminium foil. It increases the acoustic insulation of the pipe by around 25db Rw. This high performance is due mainly to the inclusion of highly absorbent tecsound and high density membrane. 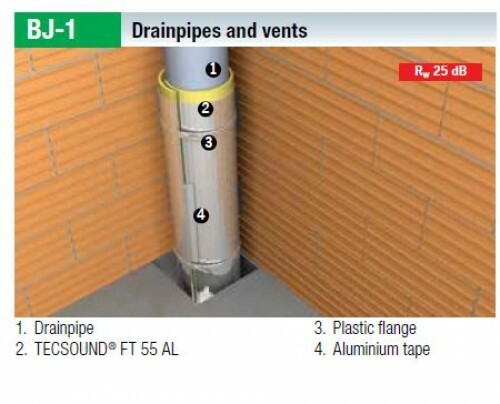 Tecsound FT 55 AL is used for acoustic insulation of drain pipes ,waste pipes and water pipes. It is also highly effective in soundproofing air conditioning vents. 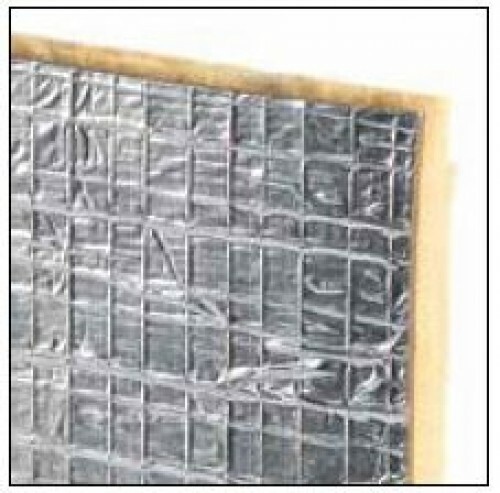 It is used in soundproofing industrial pipes and vents also. The product is regularly used to improve the performance of PVC soil pipes and down pipes that can make bathrooms very noisy. The product also has application in car soundproofing where road noise is substantially reduced . It should be applied to foil side facing upward/ outward. The Tecsound FT 55 AL is easily used. The product should be cut into suitable width strips such that it will wrap around the offending pipe. The overlap once wrapped around should be in the order of 10cm or quarter the circumference of the pipe whichever is smaller. The pipe is simply fastened using the appropriate length of plastic cable tie. The cable ties should be every 20cm or so. Ideally the overlaps should be sealed with an aluminium backed foil tape. Where the pipe is boxed in, ideally use a double layer of plasterboard to finish, filling the void where possible with mineral wool. The Acoustic Performance of the pipe wrap is Rw 25 db. Which we believe is unsurpassed.